Enjoy Great Ohio Electric Rates with Direct Energy! 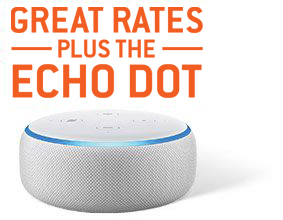 Fixed Ohio electricity rates with no termination fees and an Amazon Echo Dot can be yours today. Why Make Direct Energy Your Electric Company? Our customers are our number one priority. We aim to make your life easier by providing the resources you need to make smart decisions about your home's energy. With a broad selection of plan types, you can find which rate and term length is best for you. In addition to our products, our customer service team is available by phone or online chat to assist with billing, renewals, sign-ups or anything else you may need! We know that energy deregulation can be confusing, so we offer many educational resources to help grow your knowledge and make more informed decisions. To learn more, visit our Ohio Energy Glossary. Fixed-rate electricity allows you to secure a price per kWh and pay this rate for a defined period of time. Choosing a fixed-rate plan means you can rely on rate stability during your term length and avoid the volatility of changing market prices. For more information on the benefits of this type of plan, review our detailed fixed-rate electricity explanation in our Learning Center. What Does Electricity Deregulation Mean? Since 1999, Ohio residents have had the power to choose their electricity provider based on what which company best meets their needs. This allows you to keep the same reliable service from your local utility while giving you the choice between companies, contract lengths, terms and rates that fit your lifestyle. Competition in the market leads to a better experience for you, the consumer. You can find more information on the history of Ohio energy deregulation in our Learning Center. Is it Easy to Switch Electric Providers? Yes! Switching electricity providers in Ohio is easy. You don't have to worry about installations or disruption of service. You'll continue to be billed by your current utility company and you'll never experience change in your power during the switch to us. Whether you live in Columbus, Cleveland or another Ohio cities we service, it's easy to become a part of the Direct Energy family! Not in AEP Ohio? Please Enter Your Location We would like to provide you with the most accurate information on on our offers, including available plans and pricing. Please enter at least your zip code, but you may also enter your complete address for more detailed information.